6 Top Hideouts for You amidst the Caribbean Domains! News & Trends Summer’s Here! 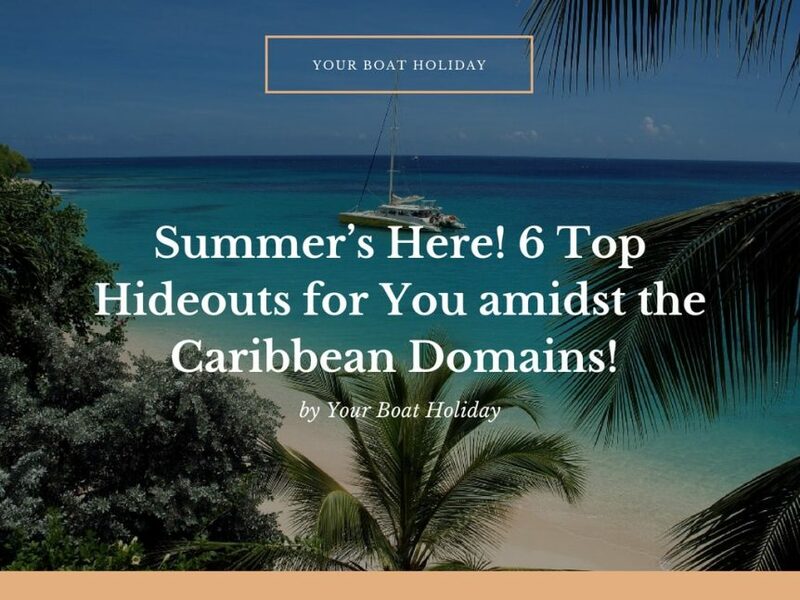 6 Top Hideouts for You amidst the Caribbean Domains! Summer’s Here! 6 Top Hideouts for You amidst the Caribbean Domains! It’s April!! Up north, people are already fed-up of the low-temperature recordings. Are you too tired with those long overcoats and mufflers? Well, how about packing your stuff and going for a Caribbean yacht charter trip? Now, you might have a question – those same old islands and their snorkelling activities – what’s new in those beaches apart from the white sand? The set of islands on the right side of Panama seems to be the only option for most, these days. Recommended: Here’s Your Direction for Hiring the Best Yacht Rentals in Caribbean! Well, folks, it’s time to pay up (oh! Stock up your bareboat sailboat, maybe). If you crave for some quietude and a dashing combo of surf and sand – here are some under-the-radar islands right from Puerto Rico to Grenadines! Officially claiming to be the best romantic hideaways and secluded beaches, these promise you NOTHING LESS THAN SURPRISE! Wannabe castaways – these are your secluded hideouts! You can book any of the Caribbean yacht charters and sail up to this pristine region which played the role of a US military base, couple of years back! Placed at around 40 miles east of Puerto Rico, this island with a stretch of 22 miles offers pure natural bliss. From horseshoe coves to yards of black sands dotted with palm trees, it allows you to take a trip to the Mosquito Bay (not literally!) which is known for its bioluminescent presence. Lost in Space someone? It’s here! Antigua was your destination. Nice. Now, sail off for another 100 minutes in one of those Caribbean yachts you booked, and you would land on the sister island of Barbuda! Green sea, around 2000 inhabitants of Codrington village, blend of pink and white sands and tranquil waves lapping at the shore – that’s what you get on this trip! Not to forget – some amazing rustic cuisine cooked up by the villagers. How does a spit of sand look amidst flashes of blue sea? Want to have a look? Book one of the Caribbean charters and sail off to Salt Cay! From whale-watching to snorkelling to some real treasure hunt games, these luminescent seas will not leave you famished. Just one point – Carry cash and charge your phone to the full before you head off (the land offers you only scenic beauty, unfortunately not modern amenities). As the name suggests, this coral block keeps big ships out of its region. Perfect for a bareboat Caribbean yacht charter trip, this stretch from the Great Bahamas gives you that tranquility which its lush waves promise. Honeymoon couple? Well, the serenity of Petit St. Vincent with some local delicacies is just what you need to explore more about your life-partner. Sail with him or her and try exploring this minuscule island, by holding your partner’s hand. Looking for tropical hideaways that have some characters in them? This bejeweled coral stretch known as sister island to St. Kitts gives you a chance to fish, sail and windsurf. Just make it a point to visit it with yacht charters Caribbean crewed set. Related: Why are Caribbean Bareboat Vacations the Perfect Holiday Escapade? A sail in the blue serenity with your partner or besties by your side this April (before the June hurricanes come calling) is a great way to start off your vacationing calendar 2018! Just make sure that you book the bareboat vessel in advance or else bookings might close for Caribbean yacht charter trip. P.S. Don’t miss out on trying the amazing sea-food that these domains offer. Don’t forget to carry your sunscreen (temperature could go up to 83-degree Fahrenheit).